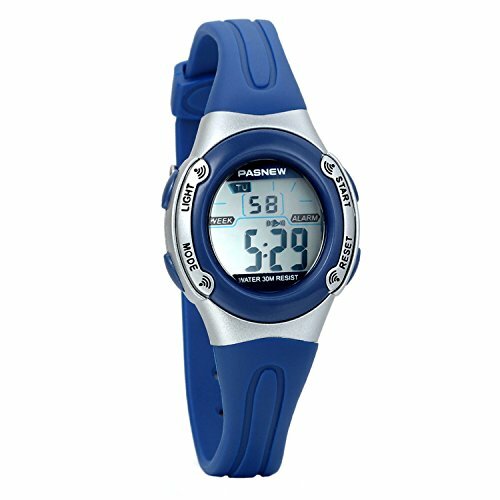 The watch is suitable for everyday use, withstands Splash/rain resistant. NOT suitable for diving, swimming, snorkelling, water-related work or fishing. - Precise movement and keep accurate time. - Displays month, date, week, day, hour, minute, and second. - 12-hour /24-hour format system for choice. - Support alarm clock function to remind you of every important moment. - Support hourly chime function. - Only to press the Light button, the LED backlight on the dial will be ON for convenient to know the time at night or in dark place. ✔ PRECISE TIME KEEPING: We only use high end Quartz movement providing precise and accurate time keeping. ✔ MULTIFUNCTIONAL- Calendar Week/Date display; Water Resistant; Shock Resistant; 5 colors changeable led back light display; Alarm function; Chronograph function. ✔ DAILY USE WATER RESISTANT- Suitable for everyday use, withstands Splash/rain resistant. NOT suitable for diving, swimming, snorkelling, water-related work or fishing. ✔ LIGHTWEIGHT AND COMFORTABLE- This cute watch only weights 20g, rubber strap is soft, flexible and durable, great for daily wearing. ✔ GIFT RECOMMONDATION- Cute design, coming with a gift box, it's a great gift for students, boys and girls as Birthday Graduation Holiday Children's Day Christmas Day present.